A good rare example, awarded to certain members of 172nd Field Regiment Royal Artillery and a few members of the 5th Bn. Hampshire Regiment; comprising an aluminium shield with raised edges, the centre covered in red felt and bearing “BEJA” tablet to top left and a Tiger tank pierced with a sword to the centre. 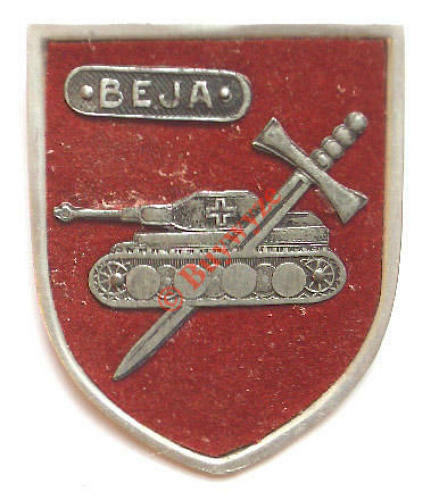 Reverse with original pin fitting To mark the supreme courage of the Regiment following the heroic action of 155 Battery, together with 5th Hampshires, against German armour at Beja, North Africa, their CO, Lt.Col. McN. Graham DSO, designed this badge and had it made in Tunis. It is believed less than 200 of these rare badges were awarded to those who had actually taken part in the action. Worn on right sleeve or right breast pocket of battledress.